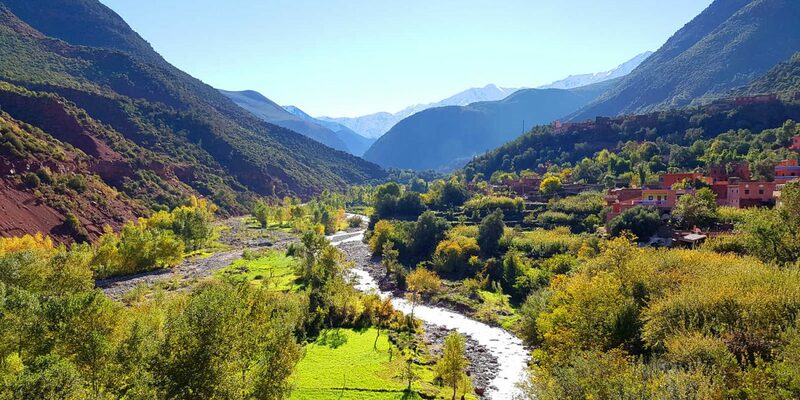 during this guided private day trip from Marrakech to high atlas mountains, we will cross the berber villages, meet a berber people, visit of a berber family and explore their private life, discover the hidden gorges and waterfalls in ourika valley, enjoy a lunch by the river. Pick up from your accommodation in Marrakech for an amazing journey in the 3 Valleys and Atlas Mountains, in a private day trip. At 9am we will start from Marrakech and travel towards the High Atlas Mountains. At the village of Asni and its hidden Berber village’s delightful spots to get away from Marrakech noise. A cluster of villages around the valley Moulay brahim set in a curving road of the High Atlas Mountains with great views of the highest mountain of Morocco and North Africa the mount of Toubkal. Along the drive we will cross many berber villages steep in hillsides, waterfalls, and lush green gardens. Stop to discover the life style of Berber people by visiting a Berber family who will welcome with a glass of mint tea. Then, continue through the Ourika Valley. In this valley we will stop to visit a cooperative run by women, before reaching the last village in the valley. “End of the Private Day Trip to Atlas Mountains and 3 Valleys”.